Beach parking at Clearwater Beach access is plentiful...as long as you get there before prime time. This is one place in Clearwater FL where you want to get there early. It is used extensively by both tourists and locals. It seems like all of the young people drive one car each. Gulfview Blvd/Mandalay Avenue can get very congested after about 10:00am. You don't want to show up about 1:00pm having high hopes of enjoying a sunny day at a great Florida beach...then find yourself circling in "holding pattern" waiting for someone to leave. Clearwater Beach access at this facility is excellent. It is a huge venue with powdery white-sugar sand and lifeguards on duty from 9:30 am - 4:30 pm. There is a "Safe Bathing Limit" that extends 300 feet out into the clear and shallow water that is marked by buoys. Boaters and Jet Ski jockeys are not allowed in this area. 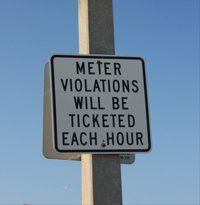 The City of Clearwater is good about cracking down on violators. There are lots of public restrooms and outside showers. Small children have a nice playground and a concession stand is there, also. For teens and young adult athletes, there are well-maintained volleyball nets. Games can get pretty competitive, at times, and you'll see some high-caliber players. Parking is strictly enforced and sad stories are not tolerated very well. The U.S. Quarter is the coin of choice here. 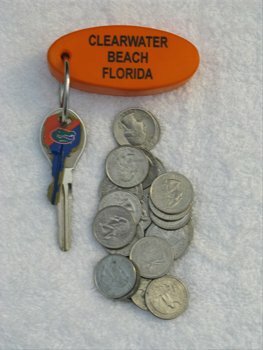 It's a good idea just to keep a little coin purse of Quarters under your front seat. Almost every beach has metered parking. There is parallel parking on Gulfview Blvd for $1.25 per hour (or more)...but come early is you don't remember your old Driver Ed technique. This is a very congested street and patience wears thin with other drivers if you don't hit the spot on the first try. Across Gulfview Blvd is the Clearwater Harbor. It is a busy place with fishing charters, lunch/sunset cruises, parasailing, and sight-seeing boats. There are plenty of places to eat if you get the least bit hungry. This Clearwater Beach access is a combination fishing spot and evening entertainment center. Jutting a few hundred feet out into the Gulf, Pier 60 has a bait house, gift shop, snacks and drinks. You can rent and buy fishing gear there along with live bait. It's a great place to watch a sunset, but can get a little smelly way out on the end. Romantic dates are best held about halfway there. Sunset at Pier 60 is a nightly event from 6:00pm until 10:00pm. It is a great place for a date. There are jugglers, street artists, musicians, and comedians. You'll see some talented glass artists that can make a beautiful dolphin from scratch with a tube of glass and a small torch. Unbelievable. Don't miss this unique nightly event. This Clearwater beach access is about 800-900 yards north of Pier 60 on Rockaway Street. You'll recognize it because the parking lot is bookended by two great beach bars/restaurants. To the north is Palm Pavilion Seaside Grill and to the south is the Rockaway Grill. Both have good food and cold beer. Mandalay Park has a small grassy area with some decent shade and a picnic table. There are small, but strangely unique restrooms. The parking lot opens at 6:00 in the morning and closes at 1:00am. You have to feed Quarters to the meter at $2.00 (or more) per hour. Bring a handful. The beach is white, sugary and fairly wide. It is a beautiful area...but very popular. 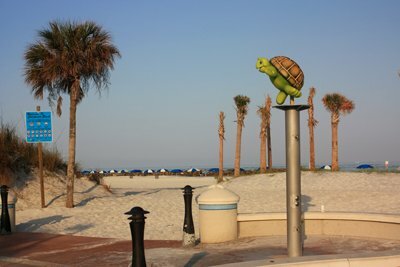 This Clearwater beach access is only several blocks north of Mandalay Park. Located between Kendall and Avalon Streets, it is a small parking lot with no restrooms or showers. The meters cost $2.00 per hour. This little area does not open until 8:00am and closes at 10:00pm. Forget about free parking. 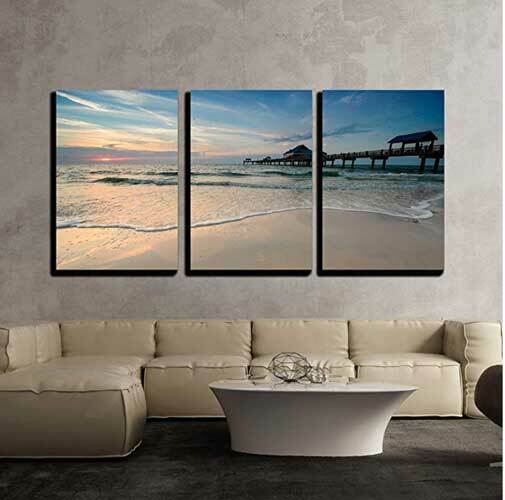 That is a Florida beach reminiscence. Keep in mind, there is NO public beach access or public parking north of Acacia Street. This area is all sequestered for guests or residents in the beach houses or condominium complexes. You'll find metered parking along Mandalay Avenue, to the south, between Acacia and Kendall Streets. Also, just north of Mandalay Park on the east side of the street is the Clearwater Beach Recreation Complex. It has a fairly large lot with metered parking. Like I said, there is NO public beach access north of Acacia Street, but you can take a long walk northward to the Caladesi Island State Park. It is a pretty walk because there are no crowds. It is very quiet and the only people using this northern most area are people from the beach houses and large condos. What do I need to know about Stingray Season on Clearwater Beach?